Many humanities faculty members have expressed concern about the situation of the humanities at Duke. It is time to come together to voice our concerns, and to brainstorm ideas for a constructive response. We are concerned that Duke’s humanities faculty have not been adequately heard about what methods of teaching and scholarship work best for them and for their students. 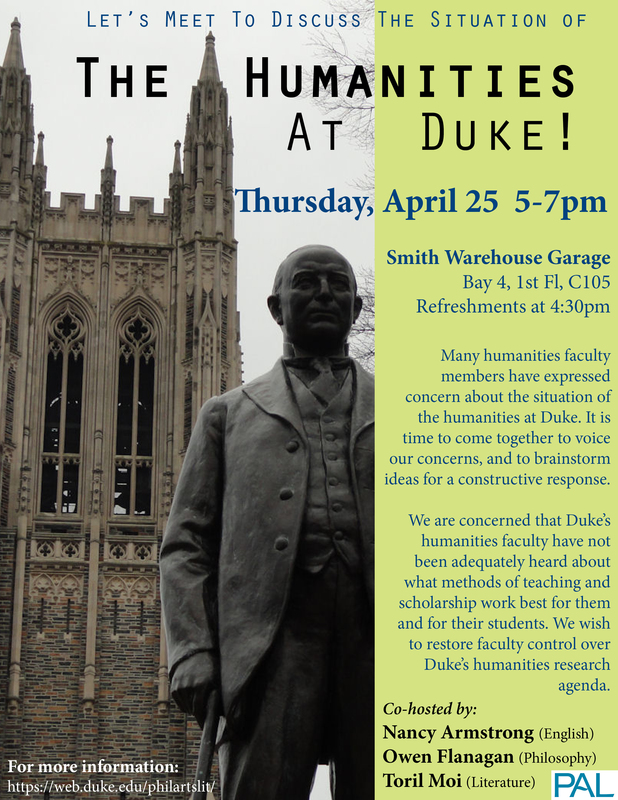 We wish to restore faculty control over Duke’s humanities research agenda. To begin a broad based conversation about the nature, function, and importance of the humanities at Duke, specifically, and in the academy more generally. To explore questions about the various goods that humanistic research and study yield. To provide an articulate collective voice for the intellectual and cultural importance of these goods. discuss critically the specific institutional obstacles to good work in the humanities (curricular power/excessive encouragement on collaborative research) created by Duke’s administrators. focus on the needs of younger scholars: graduate students and junior faculty who still have to obtain jobs and earn tenure within the traditional humanities disciplines. What kinds of institutional support and arrangements do new faculty in the humanities actually need and want? What can Duke do to help them fulfill their potential in teaching and research? Concrete proposals for how Duke can ensure that the energy and money poured into the new initiatives actually benefit the development of strong research and strong careers for young humanities faculty. Concrete proposals for how Duke’s administration can show that Duke as an institution values the humanities’ methods of work and forms of knowledge-production. Please come and join us for a discussion on April 25!